"Danny Padilla the Giant Killer's Goliath-Slaying Workout"
DISCOVER how Danny Padilla the giant killer became one of the greatest short muscle men in history. We love our story legends here in the British Isles. One particular favourite is "Jack the Giant Killer," and the tale has special significance for this week's post. Way back in King Arthur's reign, long before Joe Weider was a glimmer in his momma's eye, there lived near the Land's End of England a farmer who had an only son called Jack. Jack was a bright and resourceful lad, so nobody or nothing could beat him. In those days, the Mount of Cornwall was kept by a fierce giant named Cormoran. Measuring eighteen feet tall and three yards about the waist, he was the terror of all the neighbouring villages. This Jabba the Hutt lookalike lived in a cave in the midst of the Mount, and would often wade over to the mainland where he would seize the peoples livestock to feed his voracious appetite. The ogre had done this for many years, so all Cornwall was in despair. One day, Jack happened to be at the town hall when the magistrates were sitting in council about the giant. Jack asked, "What reward will be given to the man who kills Cormoran?" They answered, "The giant's treasure will be your reward." Brave Jack replied, "Then let me undertake it." So Jack laid a trap for this terrifying tyrant. Digging a pit outside the Mount, he covered it with sticks and straw, then sat himself on the opposite side of the pit in wait. At daybreak, he blew on his horn and roused the giant from his slumber. The noise brought the giant rushing from his cave, crying, "You shall pay for this, I will take you whole and broil you for breakfast!" Yet no sooner had he uttered the threat, and the giant tumbled headlong into the pit. Seeing his opportunity, Jack gave him a weighty knock to the crown of his head with his pickaxe, killing the giant stone-dead. For sure, it's a fun tale to tell your kids, but as we all know, giant killers don't really exist... or do they? Rewind to the 1970s and a real-life 'giant killer' roamed the bodybuilding landscape. His name was Danny Padilla and he was considered one of the greatest short muscle men ever because of his awesome symmetry and massive development. 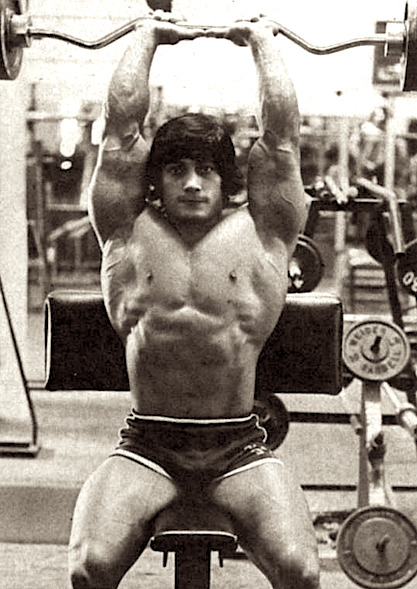 A true bodybuilding legend, Danny won his hometown Mr. Rochester (New York) competition at the age of 17, before going on to win Mr. USA in 1975 and both Mr. America and Mr. Universe in 1977. Standing only five foot two inches tall, this mighty mouse is one of only two men in history to win both titles in the same year, the other being Frank Zane. In addition to being one of the golden era greats, Danny trained simply. Using stripped-back basic concepts for lean mass gains, he didn't change his training much at all, preferring instead to stick with what worked. The concept he used to build his body was the double progression method. This method saw him employ 5 sets of 12 reps where the same weight is used on all sets. That means, the first couple of sets are basically a warm-up - by sets 3-5, the workout becomes challenging as fatigue begins to build. The goal is simple: when Danny gets 12 reps on all 5 sets, he adds weight next workout. But here's the thing... this method works equally well with other rep ranges, too. Iron Guru Vince Gironda trained his champions with his 8x8 and 6x6 workouts, just as others have built a solid foundation of strength using 5 reps for 5 sets. The secret sauce to success is that you never add weight until you earn it on that final set. It's a really simple yet challenging way to gauge your progress, but more importantly, it works. Danny Padilla the giant killer went onto slay the bodybuilding giants of his day using this muscle building principle, and you can do the same too.